I love the first week of the month! Why? Because I get to do my monthly Lending Club and passive income updates! Of all the posts I write, the geeky numbers guy in me has a field day with these! Any time I can dip my feet into the land of spreadsheets, investments, and numbers I get giddy. I am the consummate planner, so running financial projections is something I find myself doing regularly. As my girlfriend can attest, I have no problem talking about numbers… all the time. Lend Academy: Warren Buffet Makes A Huge Investment In Lending Club – Peter nailed it with this classic April Fool’s Day post! Based on the comments, looks like Peter snookered a few readers with his post! L Bee and the Money Tree: Insights from a Speaking Gig – Lauren discusses her experience giving her first speaking gig… to a small group of children! As Lauren finds out, with children, you get nothing but reality. With no pretenses these kids lead Lauren to some valuable conclusions that most of us who are in the personal finance realm can relate with. My Journey to Millions: A Review One Month into the Investment Club – Evan reviews his experiences starting an investment club with group of eight people. So far, it has been a pretty big struggle to get things moving in the right direction! As a founder and investor in a small investment club myself, it is always awesome to see others experiences with clubs. Our Freaking Budget: Pros and Cons of Moving Yourself – Johnny breaks down some of the costs of his and Joanna’s more recent moves. While moving yourself can be a major hassle, it can also be a tremendous saving, unless someone else is footing the bill! Personally, I love helping people move, although that’s probably because I’m a glutton for punishment. In reality though, nothing gets me amped up more than an 800 mile drive to Chicago! Nuts and Bolts Media: Is Your Blog Really A Business? – Andrea writes a fantastic, thought-provoking piece on determining if your blog is a business. Two key concepts she discusses are whether you are providing something of value and can your blog be sold. For me those two clearly separate personal passions versus viable businesses. Link love! Thanks so much for the link! Hello Suckers: Thanks for mentioning me in your post My inspiration in last week #15! And there we have it folks! Some pretty epic content out there this week as people continue to aggressively pursue their dreams! If you haven’t yet, be sure to follow me on Twitter, and like me on Facebook! Thanks for the mention! 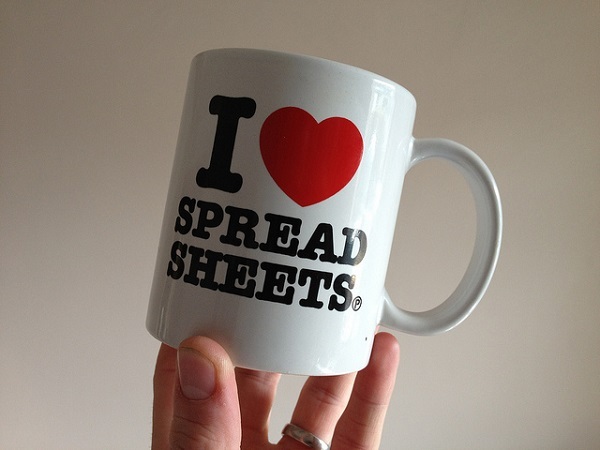 I can definitely say I do NOT heart spreadsheets, but I’m glad there are people who do. Spoken like a naturally creative person! I do not heart my complete lack of creativity and artistic talent, but I sure do love those who have it! It sounds like your girlfriend and my wife could swap stories as I am a big numbers guy as well. I had not seen that post on Buffett…definitely something that would be posted on April Fools Day. Haha it was a phenomenal April Fools Day post! Written pretty well to mimic normal posts.